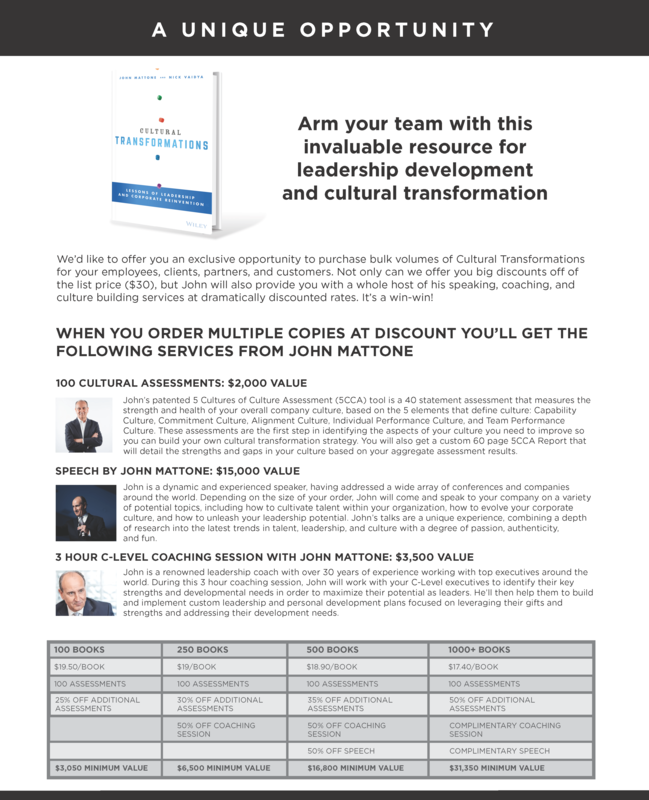 We’d like to offer you an exclusive opportunity to purchase bulk volumes of Cultural Transformations for your employees, clients, partners, and customers. Not only can we offer you big discounts off of the list price ($30), but John will also provide you with a whole host of his speaking, coaching, and culture building services at dramatically discounted rates. It’s a win-win! John’s patented 5 Cultures of Culture Assessment (5CCA) tool is a 40 statement assessment that measures the strength and health of your overall company culture, based on the 5 elements that define culture: Capability Culture, Commitment Culture, Alignment Culture, Individual Performance Culture, and Team Performance Culture. These assessments are the first step in identifying the aspects of your culture you need to improve so you can build your own cultural transformation strategy. You will also get a custom 60 page 5CCA Report that will detail the strengths and gaps in your culture based on your aggregate assessment results. John is a renowned leadership coach with over 30 years of experience working with top executives around the world. During this 3 hour coaching session, John will work with your C-Level executives to identify their key strengths and developmental needs in order to maximize their potential as leaders. He’ll then help them to build and implement custom leadership and personal development plans focused on leveraging their gifts and strengths and addressing their development needs.